If CTO is safe , should we allow all PCI ineligible ATO to evolve as CTO ? Acute total obstruction (ATO) of coronary artery is an emergency .Opening it by pharmacological or catheter is the standard ( logical ) protocol.However, time plays a crucial role in this coronary re-perfusion game.It can either be a sure shot of success or end up in total spoilsport. One more issue as important as time is from the overflowing scientific data fired by different regulators in conflicting directions (Also called knowledge) . What to do with STEMI coming late ? ATO with cardiogenic shock is an absolute emergency at any time. Hemodynamic instability is misunderstood term . Stabilizing it medically is not forbidden. Asymptomatic stable ATO beyond 24-72 hours can be semi emergency, true emergency or as cool as a cucumber depending upon the cardiologist’s wisdom , experience or inexperience and the Institutional Integrity ! When does a ATO become safe CTO ? 1 month , 3 months, 6 months ? Why we are not defining a sub-acute ATO ? or CTO in transition ? Is living peacefully with sub acute ATO or CTO a coronary crime ? We don’t require a debate , whether these questions are worth answering or not ! Though cardiac professional are committed to open up occluded arteries to save lives , reality is repeatedly teaching different stories ! The greatest danger of keeping an artery open( In disputed indications ) is the newly conferred risk of sudden closure and the attendant unpredictable aftermath ! Arguing closed artery is better than an open artery is straw man argument and inability to interpret positive things in science. However it may still be right when science suffers from hostile incursions from non academic forces. Car tyres warrant replacement every 20,000 km or so .Its batteries do require periodic attention. Human heart , which runs non stop from womb to tomb . . . deserves how much ? Unfortunately no one (What about your cardiologist?) can provide a flawless lifetime maintenance contract to this restless bio-mechanical pump ! Fortunately still, God has created this wonder organ ,that can with stand the stress of life for nearly 10 decades . . . if we live a proper life ! Degenerative aortic valve disease along with the adjacent conduction system of elderly is going to be a key cardiovascular disease in the future as the population is aging .We have made a big step forward in tackling this with innovative percutaneous aortic valve implantation (TAVI) . However ,the artificial valve is positioned vulnerablely close to conduction system and incidence of complete heart block either during implantation or follow up is high and a permanent pacemaker seems to be an integral part of this procedure for many. 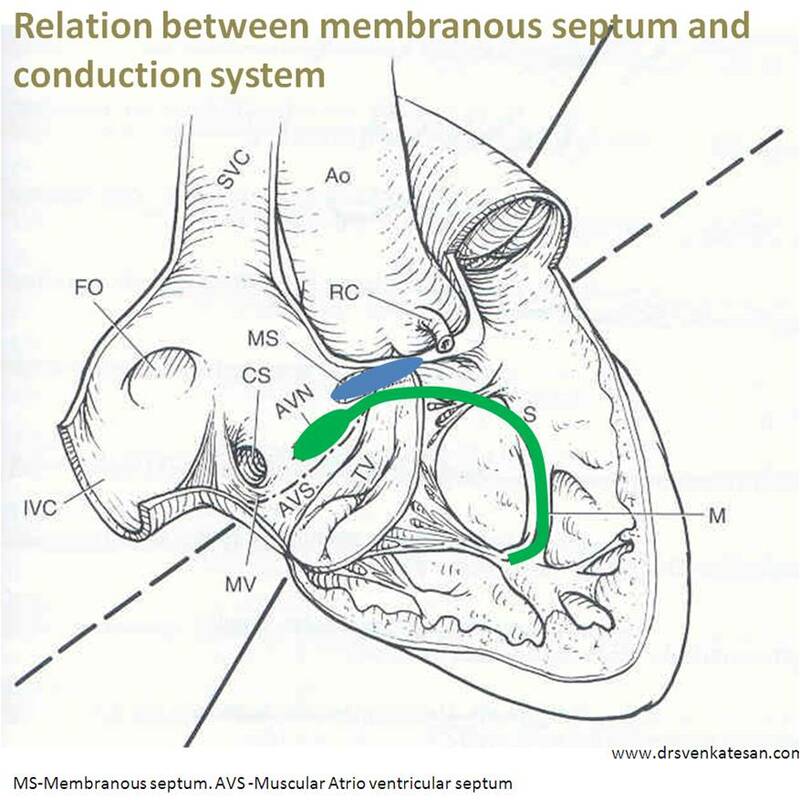 Heart seen from behind , Mitral annulus to left and tricuspid valve ring to the right . A classification of Polymorphic VT .
Failure of enocardardial cushions to separate and reach the predesignated destination ie right and left AV valve is the basic embryological feature in AV canal defect .This brings whole AV ring down and stretches the distance between the semi-lunar valve (especially aortic) with that of LV , thus elongating the LVOT into a classical goose neck deformity.The defect has a profound impact on how the AV node and its branches penetrate the ill-formed AV junctional tissue and fan out into the ventricle. There are four basic issues that are responsible for the various conduction defects in AV canal defect. Postero- inferior displacement of the A-V node is the key abnormality . Left bundle branching system by itself is also abnormal with hypoplasia left anterior bundle branches. Short HV interval is documented in AV canal defects inspite of prolonged PR due to small his bundle length.